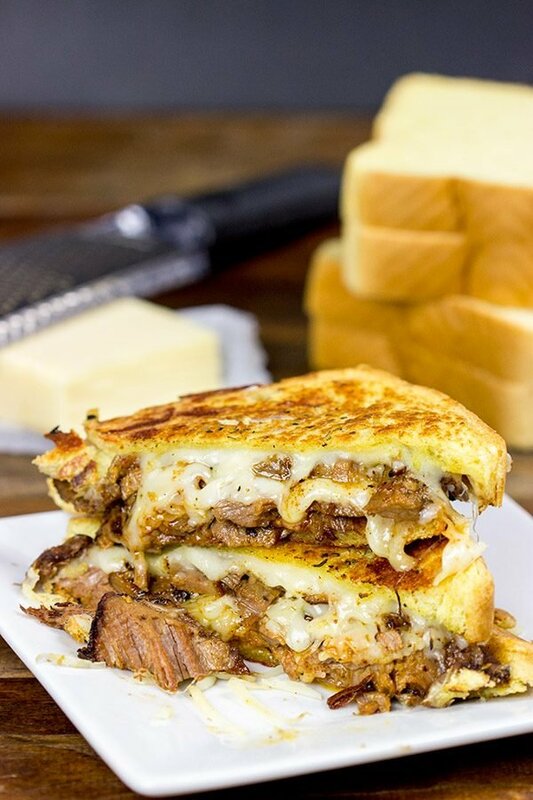 Make your next sandwich epic with this Smoked Brisket Grilled Cheese! Back at the end of last summer, my wife and I went down to Philly for a long weekend. She had a business meeting on a Tuesday, so we just made it a longer trip and stayed with some of our best friends who happen to live just outside of Philadelphia. Business trip that leads to hanging out with friends? Score! Neither of us had ever seen downtown Philly, so we took the train in one day to do a little sightseeing. After a morning of wandering the streets, we decided to grab lunch at Reading Terminal Market. I assumed this was a little cafe-style place for lunch. I assumed wrong. Reading Terminal Market (which is related to Reading Railroad for all of you Monopoly fans) is a collection of semi-permanent shops and restaurants. Imagine dozens of food trucks and specialty food vendors all under the same roof. There are communal picnic tables, so you basically wander off and find whatever kind of food you want and then meet back up to eat together. Our wives went straight for Thai food, while my buddy and I took their baby and wandered off looking for something tasty. It didn’t take long before we stumbled across a grilled cheese restaurant. Yup, a whole restaurant devoted to grilled cheese sammiches. It was pretty much my heaven! Of course, it didn’t take long after we got back home for me to pull some smoked brisket out and remake a delicious Smoked Brisket Grilled Cheese here at home. I piled some smoked brisket on top of thick Texas-style pieces of bread. Top that with a mixture of 3 different shredded cheeses. 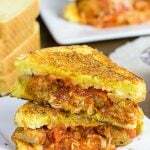 Toast it up in a skillet, and you’ve got one heck of an awesome grilled cheese sandwich! While this version was different than the one we ordered in Philly, it was equally as delicious. 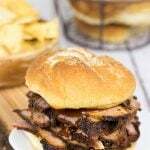 We always keep smoked brisket in the freezer, so this sandwich is pretty easy to pull together. I basically smoke a bunch of brisket each Fall and then freeze it in smaller bags. We then pull it out occasionally throughout the winter. While it may be bitterly cold outside in the dead of winter, the smoked brisket helps remind us of warm summer days. If you don’t happen to have smoked brisket on hand, then just grab some from the store or your favorite BBQ joint. 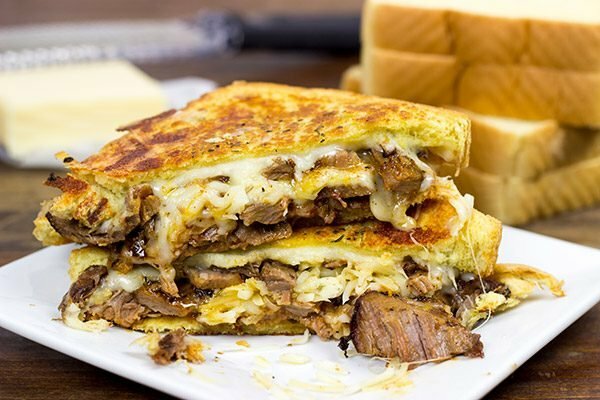 Then turn that brisket into a Smoked Brisket Grilled Cheese. Enjoy! What’s the craziest topping you’ve ever had on a grilled cheese sandwich? Preheat large griddle or cast-iron skillet over medium-low heat. Butter one side of each of the slices of bread. Sprinkle Italian seasonings and garlic powder on top. Place one slice of bread buttered-side down. 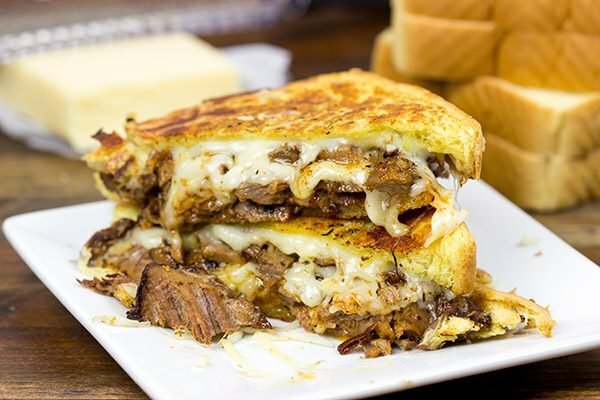 Layer grated cheeses, beef brisket and barbecue sauce on top of bread. Top with another slice of bread buttered-side out. Place sandwiches onto griddle. Cook on medium-low heat for 3-4 minutes, or until bottom slice of bread is golden brown. Flip and continue cooking until other side is golden brown and cheese has completely melted. Note: If you don’t want to smoke your own brisket, just grab some from a local BBQ restaurant. Dude – there’s a grilled cheese restaurant just down the street from me called Tom + Chee and they have a donut grilled cheese! No lie! And I’m not sure a donut could be considered a topping – but by far the most unique grilled cheese I’ve ever had! 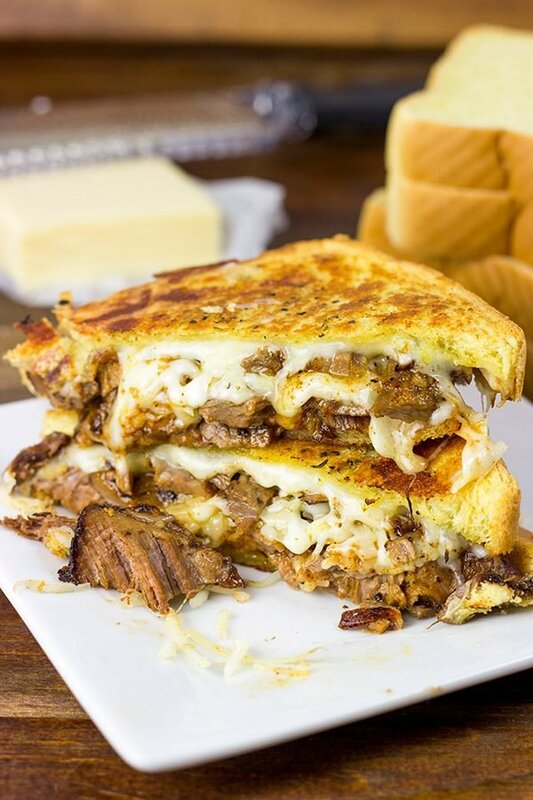 BTW – I’m not a huge brisket connoisseur – but you are making me question my ways with this fantabulous grilled cheese one! Hope y’all have a wonderful weekend! Hi David! We are of similar minds again! After St. Patty’s day when corned beef was still on sale I bought one specifically for Reuben sandwiches and guess what’s for supper? It’s brisket, just transformed. Your brisket sandwich is talking to me! It reminds me of a sandwich I had at a sub shop in Knoxville (Not Subway!!) not long ago that was really good. But I bet yours is better!! Happy weekend! 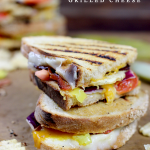 Grilled cheese sammiches, heck yeah! Wow! That is one heck of a grilled cheese! My husband would have been right there in line with you for these sandwiches. He would love this one! I love this sandwich. Love the smoked brisket combined with the grilled cheese. It looks amazing. I like making grilled cheese with other things on it, one of my favorite that I have made was one with caramelized onions and mushrooms. Drooling.. Very interesting recipe. I love sandwiches and have never tried something like this before. Just amazing! Thank you so much, Kushi! This one came about after we tried something similar at a restaurant. And I’m a huge fan of recreating meals at home! Dave I am drooling, mate- Drooling!!!!!!!! While I haen’t had brisket with cheese in a sandwich before, I had brisket with scalloped potatoes in a baguette…no cheese so it failed (not really, but it today’s context, yes!). Most bizarre topping…Hmm, I had a mac n cheese grilled cheese, but it was kind of heavy! Arman, please go clean up the drool on your keyboard. 🙂 Brisket with scalloped potatoes? I like the sound of this one. And I love a good baguette! Add a bit of cheese, and I’d be all over that one! That is an epic grilled cheese! So many people think that grilled cheese is a kids meal, but look how you can make it suitable for adults. Just load it up with all the good stuff. I need this sandwich in my life and then I will have to eat water and carrots for a month. LOL! The craziest grilled cheese sandwich I had was a collard green grilled cheese sandwich from a local food truck here in Atlanta a few years ago. It was epic! Some smoked chicken would be great with pepper jack cheese! A grilled cheese restaurant? Don’t they just call that heaven? Seriously, this sandwich has me drooling everywhere. It looks absolutely incredible!